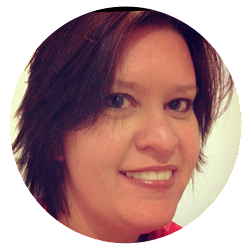 This month on the blog we are each 'playing to our strengths'. 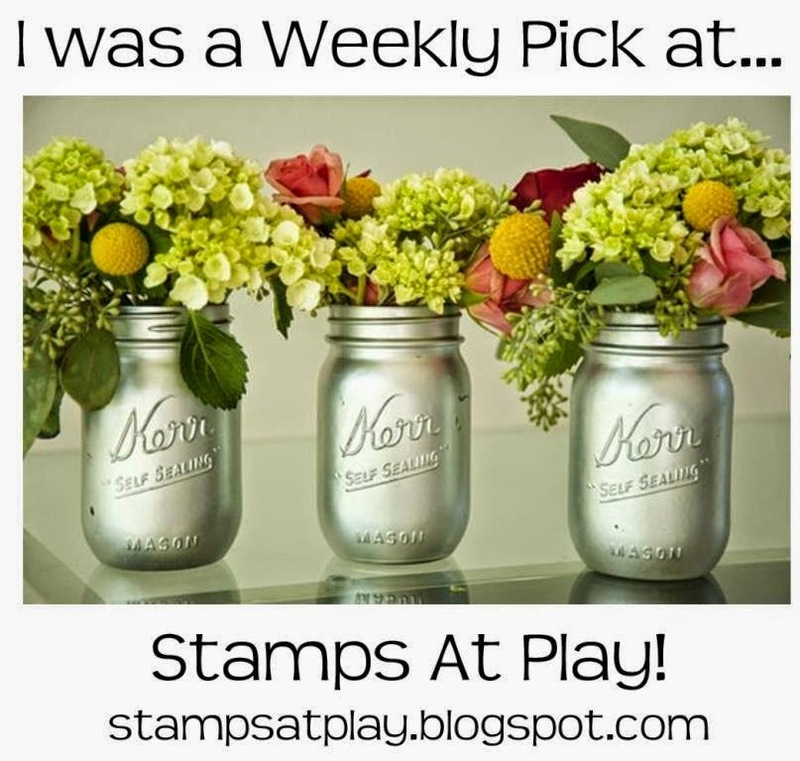 I have chosen to feature interactive card designs; they are so much fun to create and receive! I die cut numerous copies of the claw machine with Lawn Fawn You're Claw-some Lawn Cuts from Neenah Classic Crest 80lb Smooth Solar White Cardstock, 15-16 in all, with a Sizzix Bigshot Machine. 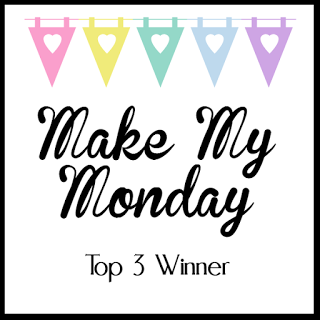 I took a negative from one of the diecut pieces and used it as a template to line up in the bottom left corner of my MISTI stamping tool. I then took one of the claw machine diecuts, inserted it into the template, lined up the claw machine stamp from Lawn Fawn You're Claw-some and closed the door of the MISTI, picking up the stamp. I stamped the image using Memento Tuxedo Black Ink, removed the die cut and replaced it with the next blank diecut. I repeated this until all the die cuts were stamped. 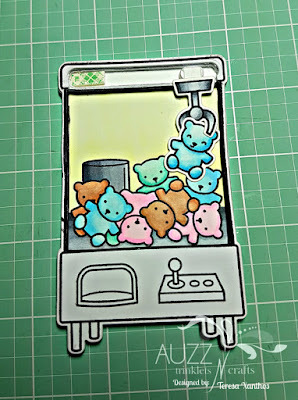 I coloured the inside of the claw machine, the teddies and around them with Copic markers, this being the base layer. I then took 10 or so of these diecuts, cut the inside of the claw machine away, using a Tim Holtz Idea-Ology Design Ruler and a craft knife. I coloured only one of these pieces for the top layer of the claw machine. 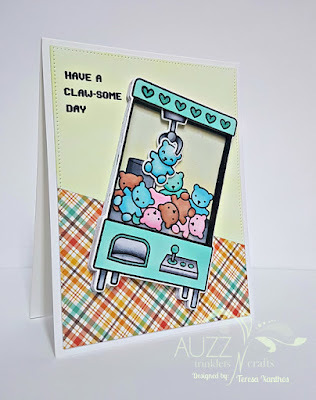 I used a die from Lawn Fawn, Slide on Over to cut a space for the My Favorite Things Slider Element to sit, into every one of the claw machine die cuts - apart from the base and top pieces. 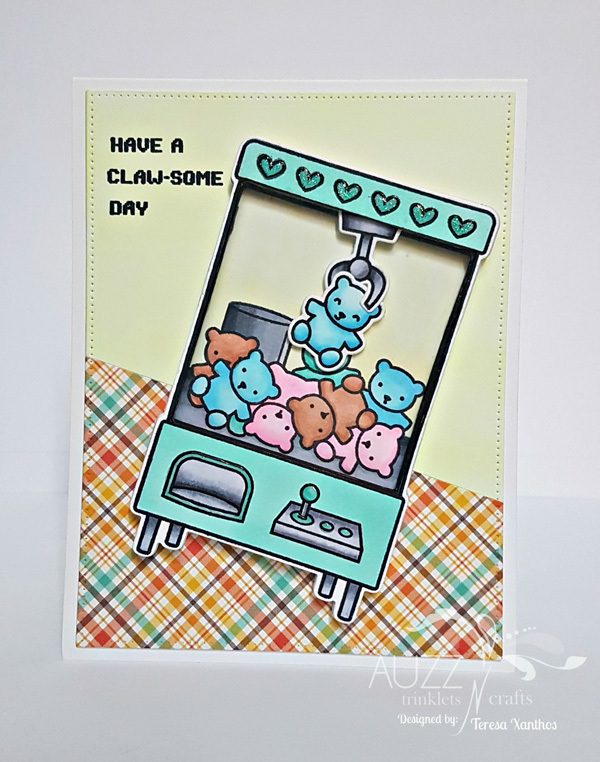 I stamped the hearts from Lawn Fawn, You're Claw-some along the top section of the machine on the top layer die cut. I proceeded to adhere these pieces together with Ranger Multi Medium Matte, lining them up carefully. The sides of the diecut are so slim, but as I built the layers, the shape gained integrity and was not so delicate. 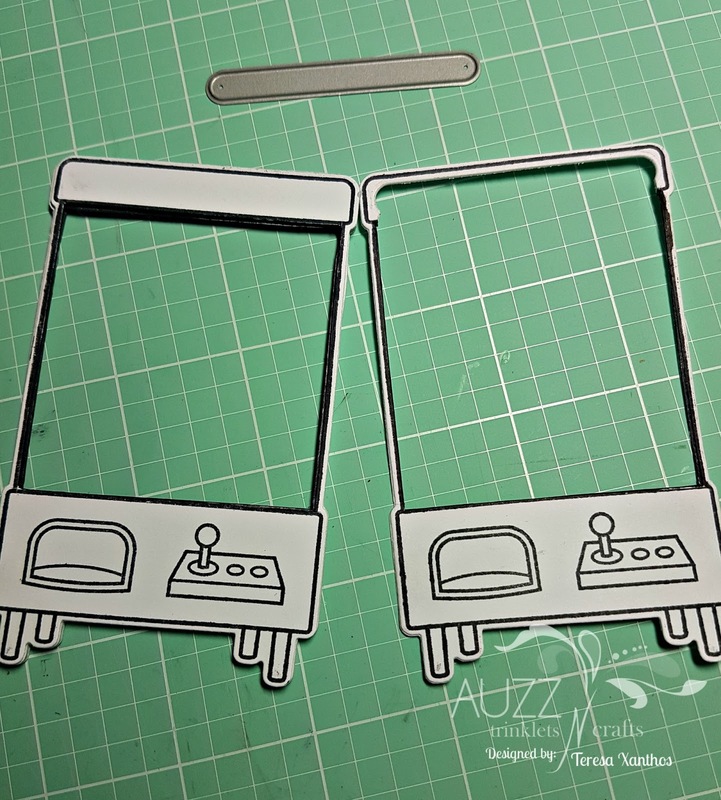 The remaining stamped dies were cut to allow the claw to slide along the top of the machine, attached to the Slider Element by a small piece of cardstock, the mechanism hidden by the top layer. I adhered these and placed the hook with Slider Element into place. I considered placing some shaker items into the space, but realised this would compromise the slider from running smoothly as they would get in the way, so decided against this. 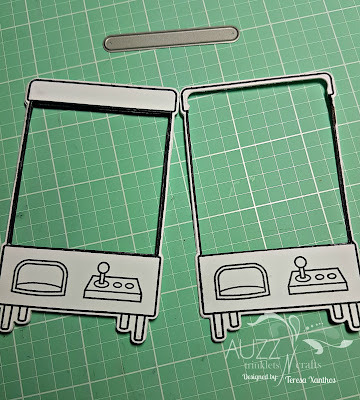 I then adhered a sheet of acetate to cover the area so it would resemble a glassed in claw machine and adhered the top layer to the machine. To assemble the card, I diecut two rectangles with a die from My Favorite Things Blueprints 21 from Neenah Classic Crest 80lb Smooth Solar White Cardstock and one from a sheet of designer paper from Lawn Fawn, Perfectly Plaid, Fall 6x6". I placed one of the Neenah rectangles and the plaid rectangle piece one on top of the other and cut them diagonally with my paper trimmer. 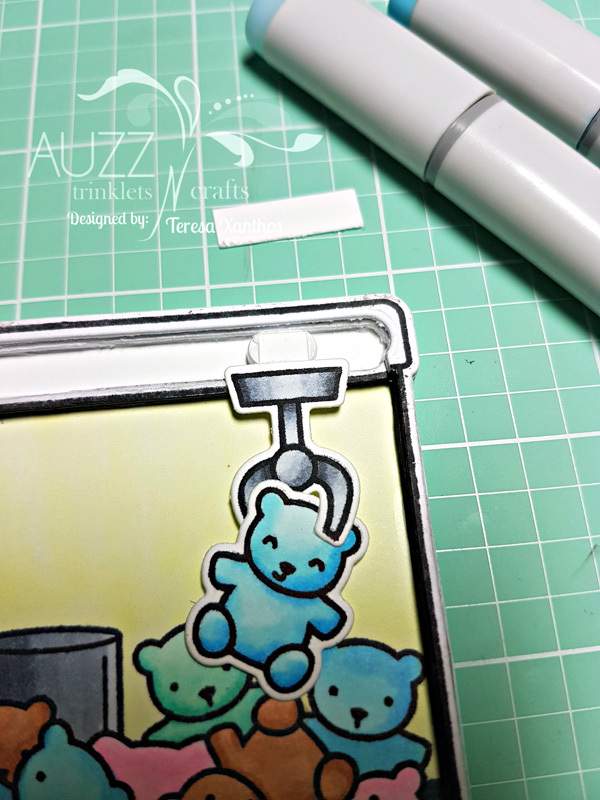 I then adhered matching pieces of the rectangle onto the second Neenah rectangle, coloured the top Neenah piece with a copic marker and I stamped the sentiment from Lawn Fawn, You're Claw-some onto this piece before adhering it directly onto the card base. 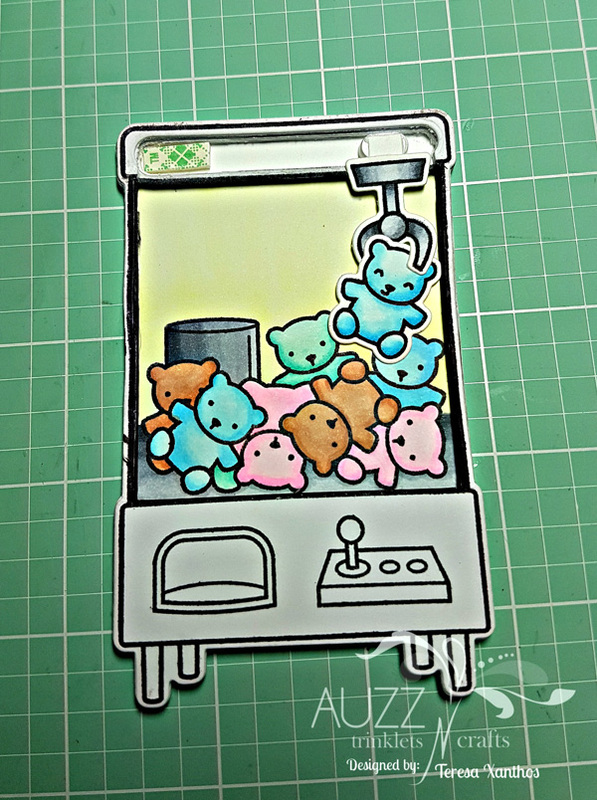 I placed the claw machine onto the card, added Tonic Studios Nuvo Crystal Drops - Glitter, Blue Lagoon onto the stamped hearts and Ranger Glossy Accents onto the joy stick controls and around the drop zone of the machine. Lawn Fawn, Perfectly Plaid, Fall 6x6"